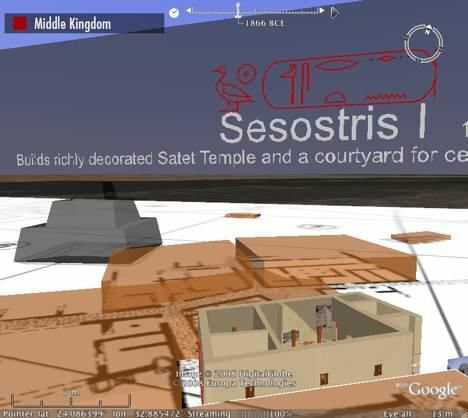 In the run-up to the talk about Google Earth and Egypt, Peter Ferschin at the Institute of Architectural Sciences, Digital Architecture and Planning at the Vienna University of Technology got in touch to show what he and his colleagues have been working on in association with the German Archaeological Institute (DAI) in Cairo: A KML and COLLADA content management system called gePublish that really pushes the envelope in helping archaeologists visualize how ancient settlements evolved over time. 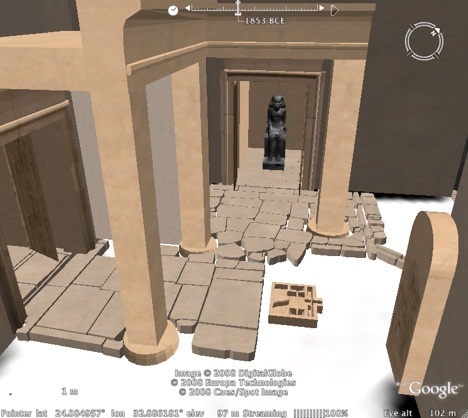 Peter, who is a computer scientist with a computer graphics background, has developed gePublish in an interdisciplinary team with architect Andreas Jonas and egyptologist Iman Kulitz. For the example you see shown on this post, they teamed up with DAI’s Dietrich Raue, a specialist on Elephantine, one of the most important archaeological sites in Egypt. 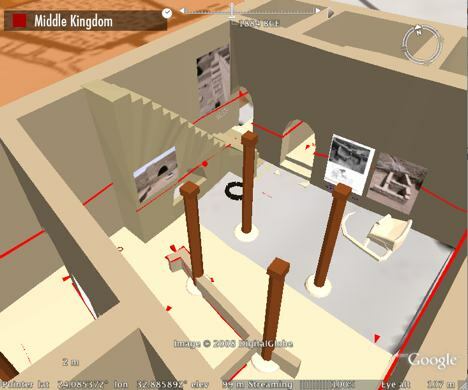 The background of the project is that we started around 3 years ago (in collaboration with the DAI/Cairo) to establish digital methods or what we like to call “Virtual Archaeology” with several pilot projects that explore several technologies and concepts with the aim to create a workflow “from the excavation to the museum”, with the idea to use the same methods for public access (e.g. exhibitions) as well as for scientific use. We also tried to adapt our methods to excavation site conditions (which you underestimate if you work in an university environment). One of our main goals is to have something like a 4D GIS system (which means real 3D models with complex geometry + textures + the possibility to use time attributes) to show architectural or urban development and future plans: processes in time and space… So when GE integrated COLLADA support we were very excited that we can now publish complex reconstructions. 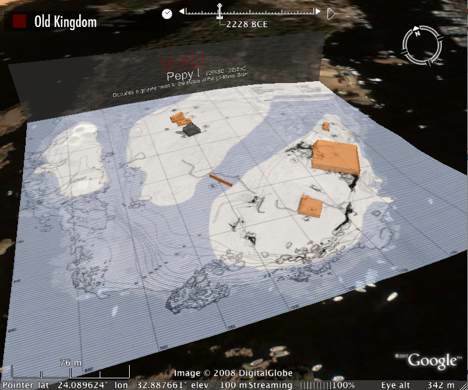 The 3D polygons that were possible in KML [before COLLADA] were not sufficient for our work. There are also some other reasons why we like COLLADA. One is that it allows to use local orthogonal coordinate systems, which is the case in architecture construction anyhow and also for excavation sites — as archaeologists have their own local grid system for spatial reference. (Of course COLLADA was also interesting because it started to become very popular…) When time tags were introduced to KML we were even more excited, because it allowed us to use historical references. The next idea was that we could use gePublish in combination with our own KML and COLLADA exporters from Cinema4D. For example, if we do a new version of a reconstructed building we can publish the 3D model to the server and the previous version gets updated. I have shifted more of the tasks like detailed georeferencing and time-attributing into Cinema4D because you can do better layouting there. So at the moment [gePublish] is a proof of concept hack; it is also not a “real” server with dynamic KML generation — but more like a KML and COLLADA content managing system. This means that at the moment we don’t use any database behind our data — but this will be part of a future extension. The reasons for JAVA are several… First, I am a Mac guy — but I know that many others are not — and JAVA was a choice to make it cross-platform… Second, there exist a lot of free JAVA libraries like for XML processing which is useful for reading and writing KML and COLLADA, as well as a SFTP library which I use to exchange files with the server. “House 70”, with a close-up. I asked him to explain the concept of the “visual index” which underpins the development of gePublish. 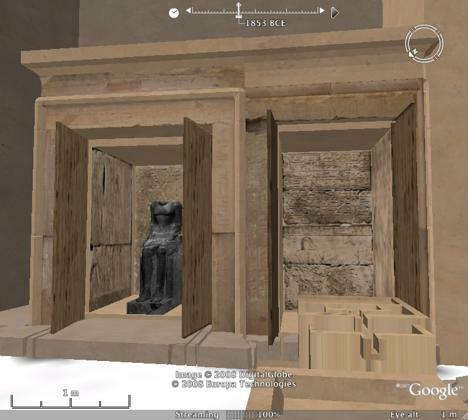 One of our main tasks is to do 3D reconstructions of architectural objects… When you start to do that you do a lot of research in the relevant literature, and this means for example studying all the excavation reports, digitizing maps and photographs (as earlier excavations did not use any digital survey techniques). Considering the meters of book publications (these large red volumes the DAI publishes and also the other publications of other institutions), and if you are not an expert of the site (and if you are not Dietrich, who probably knows every stone of Elephantine, its name, date and use) you will have a hard time to get an overview of the material. So we like to combine all relevant information into one visual display; it’s called an “index” because it is necessary to also include references to the original publication. (See “House 70”, which is the example of a visual index as a so-called “working model” of the reconstruction.) It also allows the integration of open questions at the process of reconstructing, as well as missing data. (If you start to do a reconstruction it might happen that you discover that not “everything necessary” is inside the publication report — although they are REALLY detailed). So gePublish should also work as a discussion medium for doing reconstructions. When you download the file, do give it up to 10 minutes to download some of the amazing textures for the lifelike 3D statues and wall carvings. Also, if you want to navigate inside one of the 3D buildings, try turning off terrain if you’re looking for more control or if your copy of Google Earth starts complaining. Enjoy. This is just a totally awesome application of GE and COLLADA in collaboration for such a worthy effort. thank you! Hi, can you sent me the contact adress of Mr Peter Ferschin ? 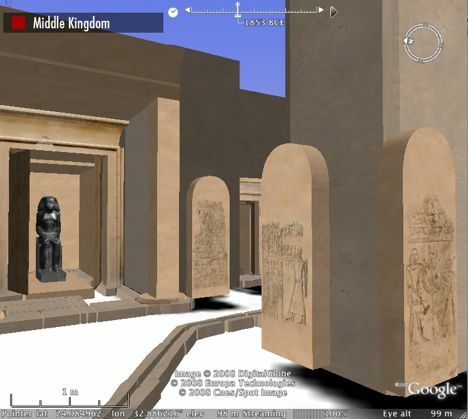 This application is amazing, I work on an archeological project in the Middle East and we wanted to do such a thing in arcgis but we met some limitations we never have been able to overcome. 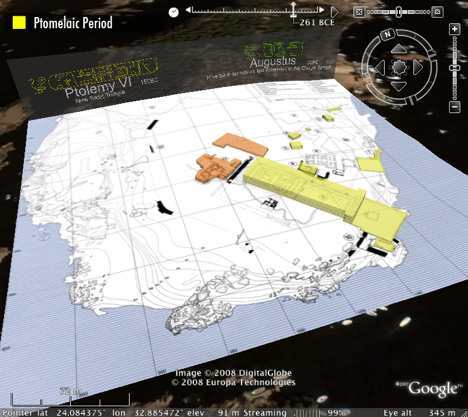 It’s great to see 3D+gis being used for a scientific purpose and not only to show off some 3D models to the public. If you want to get in touch with Peter, just leave a comment with your email address and I will forward it.